This year Chinese New Year is celebrated from Jan 31- Feb 6, and I have a delicious feast for you celebrate the year of the horse; pork dumplings, scallion pancakes, and roasted spicy broccoli. I would like to note this might not be a traditional Chinese New Year dinner, but these are a few of my favorite asian-inspired dishes to make and they are all super easy. To kick things off, and the star of the show really, we’re going to make pork dumplings. This is a recipe my sister taught me a few years ago, which she learned from one of her students while she was teaching in China. You won’t believe how easy and inexpensive they are to make. Try them once and you might just find yourself making them in large batches and tossing them into soups or cooking them up for quick appetizers. There are lots of recipes out there that show you how to make won ton wrappers or dumpling dough from scratch. I encourage you to try them, but for this recipe I’m going to be using store bought won ton wrappers. I love these things, they are great for making ravioli or even just toasting them in the oven to make a delicious chip. In a medium-sized mixing bowl combine the ground pork, ginger, garlic, scallions, salt, and pepper. Next, working with only a few wont ton wrappers at a time (leave the rest in the package so they don’t dry out as you work), use your finger tip or a brush to wet the perimeter of the won ton wrapper. Deposit a small dollop of the meat mixture in the center of the won ton wrapper (slightly less than 1 teaspoon). 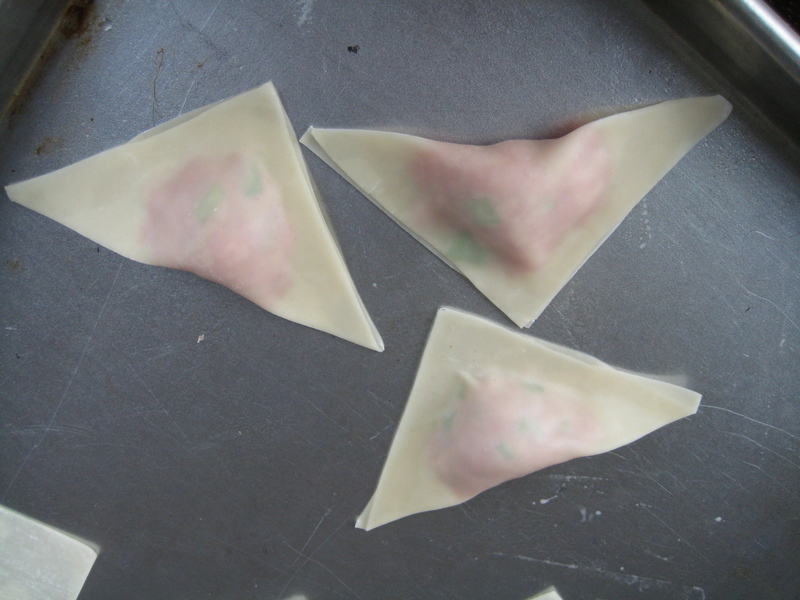 Fold one corner of the won ton wrapper to the opposite corner forming a triangle, and sealing the pork inside the wrapper, Being careful not to tear the dough, press all of the air bubbles out and seal the remaining edges. Place finished dumplings on a baking sheet that has been lightly sprayed with cooking spray to prevent sticking. If you are saving these for later I recommend freezing them on the tray first then transferring them to a zip lock bag after they are frozen. This mixture should use all the won ton wrappers in 1 package (give or take 1-2 wrappers). To cook these tasty dumplings there are a few different methods, they can easily be added to any soup by boiling them in the broth for a few minutes. However, my favorite way to cook them is by browning them slightly and then finishing them with steam. Here’s how: start by heating 1 tablespoon of oil in a large frying pan over medium-high heat. Once the oil is hot and easily coats the bottom of the pan place 5-6 dumplings on the pan. Fry until the bottoms are golden brown, about 2-3 minutes. Very carefully add 1/2 cup of water to the pan and cover the pan. Allow the dumplings to cook in the steam for 4-5 minutes. All water should be dissolved. Remove the lid and reduce heat to medium-low. Finish cooking the dumplings for 3 minutes. Remove the dumplings from the pan and repeat the process until the desired amount of dumplings have been cooked. *A Note on this recipe: Yes, this is technically a Korean pancake recipe not a Chinese pancake recipe, but it’s super easy and it’s my dinner so I’ll make what I want! Combine all ingredients except oil and allow the mixture to rest for 10 minutes. Heat 2 teaspoons of oil on a medium-sized frying pan. Once the oil is heated and easily coats the bottom of the pan pour enough batter into the pan to cover the bottom of the pan entirely. Cook the batter until browned on the bottom, about 4 minutes. Gently flip the pancake over and fry the bottom of the pancake for about 2 minutes. The bottom should be browned and lovely. Remove from pan and cut into wedges. Repeat this process with the rest of the batter. *This ingredient can easily be substituted with dried chili pepper flakes if desired. Place baking sheet in the oven and preheat to 450 degrees. Combine all ingredients except garlic in a mixing bowl so that all the broccoli is evenly coated. When the oven is up to temperature carefully remove the baking sheet and spray with a non stick cooking spray. Place the broccoli onto the baking sheet and bake for 5 minutes; remove from oven. Add the garlic to pan and stir. Bake an additional 5 minutes or until broccoli is lightly browned. Next, working with only a few wont ton wrappers at a time (leave the rest in the package so they don’t dry out as you work), use your fingertip or a brush to wet the perimeter of the won ton wrapper. Deposit a small dollop of the meat mixture in the center of the won ton wrapper (slightly less than 1 teaspoon). Place finished dumplings on a baking sheet that has been lightly sprayed with cooking spray to prevent sticking (If you are saving these for later I recommend freezing them on the tray first then transferring them to a zip lock bag after they are frozen). To cook the dumplings; start by heating 1 tablespoon of oil in a large frying pan over medium-high heat. Once the oil is hot and easily coats the bottom of the pan place 5-6 dumplings on the pan. Fry until the bottoms are golden brown, about 2-3 minutes. Place baking sheet in the oven and preheat to 450 degrees. Combine all ingredients except garlic in a mixing bowl so that all the broccoli is evenly coated. When the oven is up to temperature carefully remove the baking sheet and spray with a non stick cooking spray. Place the broccoli onto the baking sheet and bake for 5 minutes; remove from oven. Add the garlic to pan and stir. Bake an additional 5 minutes or until broccoli is lightly browned.